Dreaming of lazy sunny days lounging by your own blue paradise? If you’re in the market for a backyard oasis in the form of a pool, you’ll need to consider a few things regarding your existing irrigation system. With just a couple of preparations your pool installation can flow as smooth as, well, water! Inform your irrigation specialist of your upcoming project. When you make the call to your irrigation maintenance company, you should already have pool plans and have a confirmed start date. The technician will need to know exactly where on property your pool is going to be. Your irrigation service technician should find and flag all irrigation components within the pool installation area. This will be helpful to the crew constructing the pool and to any other contractors that may need to work in the area. Pool installation requires heavy machinery and digging. Your irrigation specialist will need to cap any sprinkler lines that encroach upon the pool area. This serves two purposes: the first is that you can continue to run your irrigation system for the remaining parts of your property without worrying about water loss or unnecessary water usage in the pool area. The second is that when sprinkler lines in the construction area are damaged or removed, as they naturally will be, they are less likely to affect the rest of the irrigation system. Keep communication open with your sprinkler company so they can schedule repairs quickly if the irrigation system is affected outside of the pool area. Your irrigation lines will need to be rerouted around the new pool, so make them aware of any changes to the construction plans. Keep in mind that depending on the type of construction a new sprinkler zone may be needed to accommodate surrounding plants and sod. Planning ahead makes a world of difference for keeping projects on track. 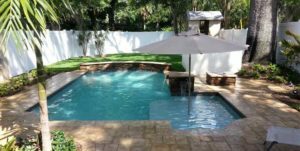 Trust Total Sprinkler and Lighting to bring twenty years of experience to your pool installation project and provide the incredible customer service that we have become known for here in Central Florida. We’re happy to provide our expertise in commercial and residential irrigation systems to customers in Orlando, Kissimmee, Lake Nona, Lake Mary, Heathrow, Sanford, Casselberry, Altamonte Springs, Maitland and the surrounding areas.